I forced myself, and it was really hard, not to organize the next cross-stitch project until I had finished the banner. As I just have to finish the top of it once the dowel is cut, I spent time, last night organizing the thread and fabric for the next piece. It's going to be a bigger endeavor with a lot of stitching. It's mostly full stitches. Very few 1/2 or quarter stitches. 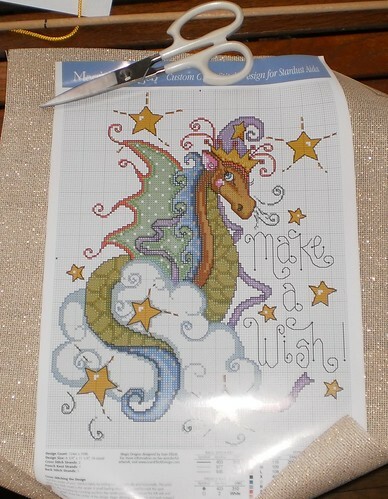 I selected a fabric color with sparkles which I think is going to make the design really pop to vision. I'm also changing a couple colors to go with the fabric. It's an oatmeal color with gold sparkles. And, as with the recent cat gift I made, I'm two colors short. It just boggles my mind that with hundreds of colors at my disposal, I can be two colors short. So, I unroll the fabric from its tube and find another pattern. I bet my grand nieces would love something like this for their rooms. That's a ways down the road.